The directors of Tiger Resources Limited (ASX:TGS) advise that Tiger&apos;s Chairman Mr Neil Fearis will step down as Chairman of the Company and retire from the Board with effect from 31 December 2015 and Mr Mark Connelly will assume the role of Chairman from that date. Tiger Resources Limited (ASX:TGS) is pleased to report the successful completion of the institutional component of its accelerated entitlement offer ("Institutional Entitlement Offer") announced on 16 December 2015. Further to its announcement of 23 October 2015, Tiger Resources Limited (ASX:TGS) is pleased to advise that it has now agreed final terms for a US$162.5 million finance facility with Taurus Mining Finance Fund and International Finance Corporation, a member of the World Bank Group. 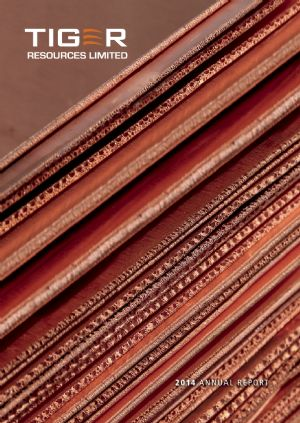 Tiger Resources Limited (ASX:TGS) delivered an improved and consistent production performance in Q3 2015 with 7,139 tonnes of copper cathode produced and 6,833 tonnes sold. Cash operating costs were US$1.40/lb, with a US$1.63/lb all-in sustaining cash cost. Tiger Resources Limited (ASX:TGS) is pleased to announce that it has agreed a terms sheet with Taurus Mining Finance Fund ("Taurus") and International Finance Corporation ("IFC"), for a common terms agreement for a USD162.5m secured financing facility ("Facility") for the refinancing and expansion of the Kipoi Copper Project in the Katanga Province of the Democratic Republic of Congo ("DRC"). Tiger Resources Limited (ASX:TGS) is pleased to announce the appointment of senior mining industry professional Mark Connelly as an independent non-executive director of the Company. Tiger Resources Limited (ASX:TGS) is an Australian-based minerals resource company engaged in the mining and production of copper. 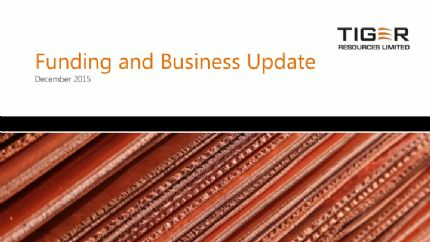 Tiger Resources Limited (ASX:TGS) reported a record performance for Q2 2015 with 6,732 tonnes of copper cathode produced and 6,972 tonnes sold. Cash operating costs decreased by 5% from Q1 2015, reflecting the benefit of the increase in production volumes following the end of the wet season in April. Tiger Resources Limited (ASX:TGS) is pleased to announce positive results of an engineering and costing study for the debottlenecking of the Kipoi SXEW plant to increase production to 32,500tpa. 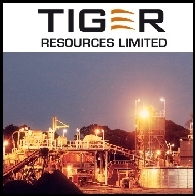 Tiger Resources Limited (ASX:TGS) is pleased to announce that it has agreed terms with Taurus Mining Finance Fund ("Taurus") for the refinancing of Tiger&apos;s existing secured debt facilities and arrangement of a new facility to fund potential debottlenecking works at the Company&apos;s Kipoi Copper Project in the Democratic Republic of Congo ("DRC"). The Board of Tiger Resources Limited (ASX:TGS) would like to take this opportunity to update you on a number of important initiatives the Company is taking to restore shareholder value. Tiger Resources Limited (ASX:TGS) is pleased to provide an update on the operating performance of the solvent-extraction and electro-winning plant at its Kipoi Copper Project in the Democratic Republic of Congo following completion of the first 12 months of cathode production. 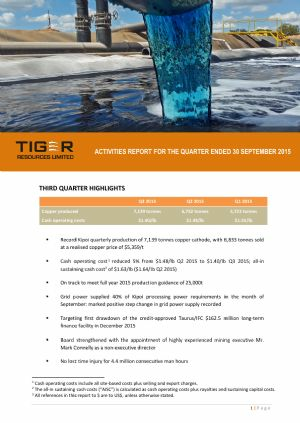 Tiger Resources Limited (ASX:TGS) announce the March 2015 Quarterly Activities Report with significant highlights. (Chairman&apos;s Statement) I am pleased to present the 2014 Annual Report for Tiger Resources Limited (ASX:TGS) and reflect on a year in which our Company achieved important milestones in the development of our flagship Kipoi Copper Project in the Democratic Republic of Congo, including the commencement of copper cathode production following the commissioning of the solvent extraction electrowinning plant. Tiger Resources Limited (ASX:TGS) is pleased to announce that Ore Reserves for Stage 2 of its Kipoi Copper Project in the Democratic Republic of Congo have increased to 689,000 tonnes of copper. Tiger Resources Limited (ASX:TGS) advises that its 2015 Annual General Meeting will be held at 2.30pm (WST), Wednesday 27 May 2015 at the Function Room, QV1 Conference Centre, Level 2, QV1 Building, 250 St George&apos;s Terrace, Perth, Western Australia. Tiger Resources Limited (ASX:TGS) is pleased to announce that it has agreed amended terms with Taurus Mining Finance Fund in respect of the US$100 million acquisition finance facility entered into on 27 August 2014. The facility is currently drawn to US$75 million. 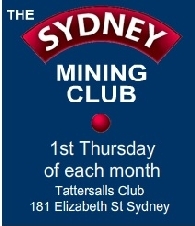 Tiger Resources Limited (ASX:TGS) announces the latest Corporate Presentation February 2015. Tiger has a proven operating record in the DRC. Tiger Resources Limited (ASX:TGS) ("Tiger") is pleased to provide an update on operations at its Kipoi Copper Project in the Democratic Republic of Congo and future strategy. Tiger Resources Limited (ASX:TGS) is pleased to announce it has been assigned a provisional &apos;B2&apos; credit rating from Moody&apos;s Investor Services and a &apos;B-&apos; credit rating from Standard and Poor&apos;s, with both agencies citing a stable outlook on their respective ratings. 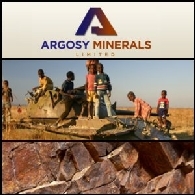 Tiger Resources Limited (ASX:TGS) announce the first copper cathode was produced on 25 May 2014 after completing construction of the solvent extraction electro-winning (SXEW) plant at Kipoi. The annual nameplate production rate of 25,000 tonnes of copper cathode was reached and sustained for the month of September. Tiger Resources Limited (ASX:TGS) is pleased to announce it has completed the acquisition of the remaining 40% shareholding in Société d&apos;Exploitation de Kipoi SA, the owner of the Kipoi Copper Project in the Democratic Republic of Congo (DRC). Tiger Resources Limited (ASX:TGS) is pleased to announce that the solvent-extraction and electro-winning (SXEW) plant at its Kipoi Copper Project in the Democratic Republic of Congo (DRC) has achieved nameplate production of copper cathode. Shares subscribed for under the Retail Entitlement Offer and shares subscribed for under the Underwriting Agreement are expected to be issued on Friday, 26 September 2014 and commence quotation on ASX on Monday, 29 September 2014. Tiger Resources Limited (ASX:TGS) Retail Offer Booklet offering an accelerated non-renounceable rights issue. 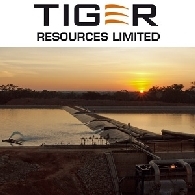 Tiger Resources Limited (ASX:TGS) is pleased to announce the successful completion of the institutional components of its capital raising announced on 28 August 2014. Tiger Resources Limited (ASX:TGS) provides the Investor Presentation Acquisition of Remaining 40% in Kipoi with the executive summary reproduced below. Tiger Resources Limited (ASX:TGS) is pleased to announce that it has entered into an agreement to acquire the remaining 40% shareholding in Société d&apos;Exploitation de Kipoi SA. SEK is the owner of the Kipoi Copper Project in the Democratic Republic of Congo ("DRC"). Tiger Resources Limited (ASX:TGS) is pleased to announce that the solvent-extraction and electro-winning (SXEW) plant at its Kipoi Copper Project in the Democratic Republic of Congo (DRC) has achieved commercial production of copper cathode. 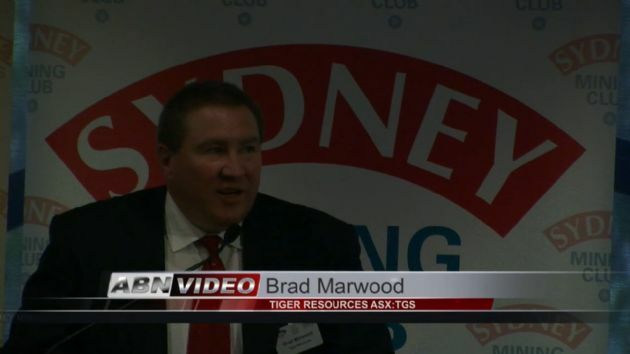 Tiger Resources Limited (ASX:TGS) provides the opportunity to listen to a BRR Media interview with the Company&apos;s Managing Director, Mr Brad Marwood in relation to the June 2014 Quarterly Reports released earlier today. 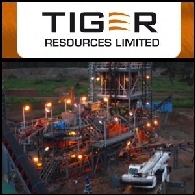 Tiger Resources Limited (ASX:TGS) provides the June 2014 Quarterly Activities Report including the Stage 2 Kipoi SXEW plant commencing cathode production. Tiger Resources Limited (ASX:TGS) ("Tiger") is pleased to advise it has arranged a further $25 million advance payment facility ("Second Advance") from Gerald Metals SA ("Gerald") to Tiger&apos;s 60% subsidiary, Société d&apos;Exploitation de Kipoi SPRL ("SEK"), the operator of the Kipoi Copper Project in the Democratic Republic of Congo (DRC). Further to its announcement dated 13 June 2014, Tiger Resources Limited (ASX:TGS) confirms the completion of capital raising of A$20.36M with the issue of 59,886,610 shares to institutional, sophisticated and professional investors identified by Canaccord Genuity (Australia) Limited and UBS AG (NYSE:UBS), Australia Branch who acted as Joint Lead Managers and Bookrunners to the placement offer. Tiger Resources Ltd (ASX:TGS) is pleased to announce a share placement to professional, sophisticated and other exempt investors at an issue price of A$0.34 per share to raise approximately A$20 million (US$18.7 million) ("Placement"), before expenses of the issue. Tiger Resources Limited (ASX:TGS) presents their June Presentation. Tiger Resources Limited (ASX:TGS) has started copper cathode production at its Kipoi Copper Project in the Democratic Republic of Congo (DRC). Tiger Resources Limited (ASX:TGS) AGM Presentation: a low-cost, rich, DRC copper presentation. 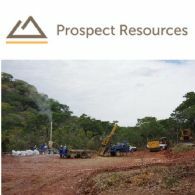 Tiger Resources (ASX:TGS) Kipoi Copper Project is located approximately 75km NNW of Lubumbashi in the Katanga Province of the DRC. Tiger has a 60% interest in La Société d&apos;Exploitation de Kipoi SPRL (SEK), a DRC-registered company which holds the project assets and is the operator at Kipoi. MCK has been the mining contractor at Tiger&apos;s Kipoi Copper Project in the Democratic Republic of Congo ("DRC") since the Company started producing copper concentrate at Kipoi in May, 2011. MCK, a local DRC-based company, approached Tiger about becoming a shareholder. Tiger Resources Limited (ASX:TGS) is pleased to announce an increase to the Mineral Resource at Kipoi Central, the principal deposit at its 60% owned Kipoi Copper Project, in the Democratic Republic of Congo. Tiger Resources (ASX:TGS) along with the Annual Financial Statements for the company, the Kipoi activities included the continued operations of the Stage 1 heavy media separation (HMS) plant to produce copper concentrate, and the construction of the first phase 25,000 tpa copper cathode production facilities of the Stage 2 solvent-extraction and electro-winning plant (SXEW). Tiger Resources Limited (ASX:TGS) (TSE:TGS) is pleased to advise that the Company&apos;s Board of Directors has approved a Dividend Policy. Tiger Resources Limited (ASX:TGS) the ASX&apos;s lowest cost and fourth largest copper producer (behind OZL, PNA, SFR) provide the latest company presentation. 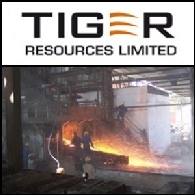 Tiger Resources Limited (ASX:TGS) (TSE:TGS) ("Tiger" or "the Company") is pleased to report its activities in the Democratic Republic of Congo (DRC) for the December 2013 Quarter. Tiger Resources Limited (ASX:TGS) (TSE:TGS) is pleased to announce updated economics for Stage 2 production at its 60%-owned Kipoi Copper Project in the Democratic Republic of Congo (DRC). Tiger Resources Limited (ASX:TGS) (TSE:TGS) is pleased to announce a 112% increase in the estimated Ore Reserve for Kipoi Central Stage 2 open pit, the principal deposit at the Kipoi Copper Project in the Democratic Republic of Congo (DRC). Tiger Resources Limited (ASX:TGS) is pleased to announce it has achieved its 2013 production guidance of 41,000-43,000 tonnes of copper-in-concentrate at the Company&apos;s Kipoi Copper Project in the Democratic Republic of Congo (DRC). Tiger Resources Limited (ASX:TGS) (TSE:TGS) is pleased to provide an update on heap leach commissioning activities for the Stage 2 solvent-extraction and electro-winning (SXEW) processing plant at its Kipoi Copper Project in the Democratic Republic of Congo (DRC). Tiger Resources Limited (ASX:TGS) is pleased to announce that FirstRand Bank Limited, acting through its Rand Merchant Bank division (RMB), has confirmed internal credit approval for its participation in the US$30 million bridging facility which it is jointly arranging with Nedbank Limited, acting through its Nedbank Capital division (Nedbank Capital). Asian Activities Report for September 21, 2011 includes: Impact Minerals Limited (ASX:IPT) has commenced a major drilling programme at its Botswana Uranium Project; Cokal Limited (ASX:CKA) has purchased an additional 10% of both the Bumi Barito Mineral and Borneo Bara Prima metallurgical coal projects in Indonesia; Manas Resources Limited (ASX:MSR) reported final results from drilling at its 100%-owned Shambesai Gold Project in the Kyrgyz Republic; Tiger Resources Limited (ASX:TGS) provided a production update for August 2011 from its high-grade Kipoi Copper Project in the Democratic Republic of Congo; Tata Consultancy Services Limited (BOM:532540) has signed a five-year multi-million contract with Deutsche Bank (NYSE:DB). Asian Activities Report for June 16, 2011 includes: Tiger Resources Limited (ASX:TGS) announced the first sales of copper concentrate produced from its Kipoi Copper Project in Congo; Altura Mining Limited (ASX:AJM) upgraded the exploration target for Pilgangoora Lithium Project; Cove Resources Limited (ASX:CVE) has identified a new gold target at the Goongarrie Project in Western Australia; Voyager Resources Limited (ASX:VOR) has entered into a number of service contracts to facilitate the exploration of its key projects in Mongolia. Australian Market Report of March 7, 2011 includes: Argosy Minerals Limited (ASX:AGY) has been granted iron ore and chromite exploration licences in Sierra Leone; Quest Minerals Limited (ASX:QNL) announced 151Mt magnetite and vanadium resource at the Victory Bore tenement in Western Australia; Elemental Minerals Limited (ASX:ELM) announced further shallow high grade assay results from the Sintoukola Potash Project in Congo; Tiger Resources Limited (ASX:TGS) (TSE:TGS) reported significant copper intercepts at Sase Central and Sase South Prospects in Congo. Australian Market Report of January 14, 2011 includes: Tiger Resources Limited (ASX:TGS) (TSE:TGS) updated on Kipoi Copper Project stage 1 construction; Haranga Resources Limited (ASX:HAR) revealed positive magnetic survey result at the Sumber iron ore project in Mongolia; Universal Coal plc (ASX:UNV) announced significant resource increase in Kangala Thermal Coal Project in South Africa; Orion Gold NL (ASX:ORN) has identified significant system of gold mineralisation at the Happy Go Lucky Prospect in Victoria. 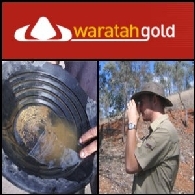 Australian Market Report of December 15, 2010 includes: Waratah Gold Limited (ASX:WGO) signed Convention with Congo Government for Youkou Iron Ore Project; Tiger Resources Limited (ASX:TGS) said that Kipoi Copper Project stage 1 construction progresses smoothly; Axiom Mining Limited (ASX:AVQ) have received strong gold and silver results in Queensland; Greenland Minerals and Energy Limited (ASX:GGG) has received approval to fully evaluate the Kvanefjeld multi-element project. 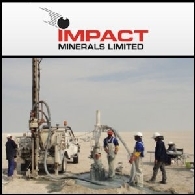 Tiger Resources Limited (ASX: TGS) - Drill Results Confirm Major Discovery at Pumpi - Mr David Young, Managing Director; Tiger Resources Limited (ASX: TGS) present the following audio webcast regarding "TGS - Drill Results Confirm Major Discovery at Pumpi - Mr David Young, Managing Director". You may also download this audio webcast to your computer or portable audio player.